Empennage: Empennage fairings. Filling in the gaps. 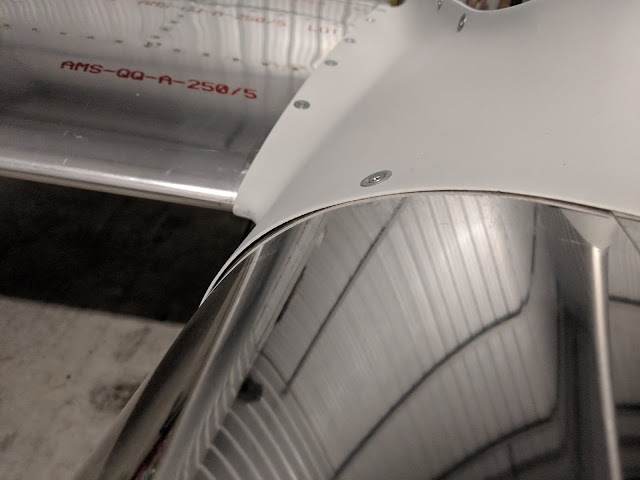 My F-01496 Empennage Fairing had quite a bit of pillowing on the forward edge. Good place for rain to blast in there. So I decided to fill in the area. I laid down packing tape in the skin, scuffed the underside of the fairing, slathered epoxy-flox on it, drenched the screws in Boelube, fastened the fairing back down to the plane then let it sit over night. After cleaning up the mess, it came out nicely. Maintenance: Starter failure at 43 hours. 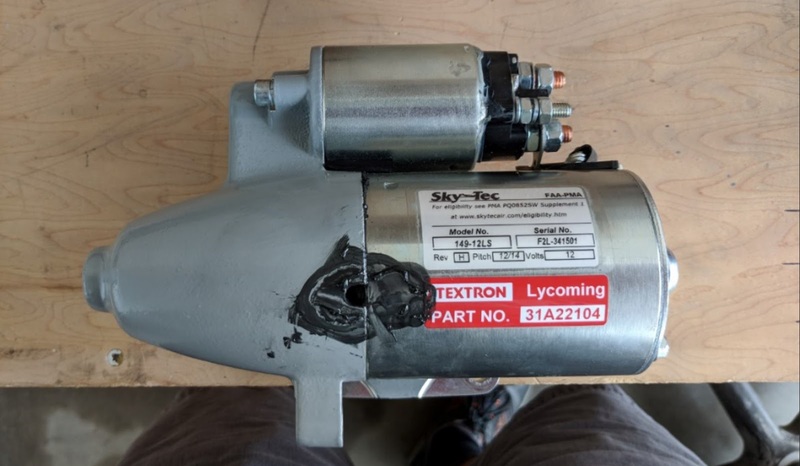 My XIO-390-A3B6 came from Lycoming with a SkyTec 149-12LS starter, S/N F2L-341501 (I think that means 34th production week of 2015 on day 1). It failed when I was away from my home drome with 43 hours on the Hobbs. 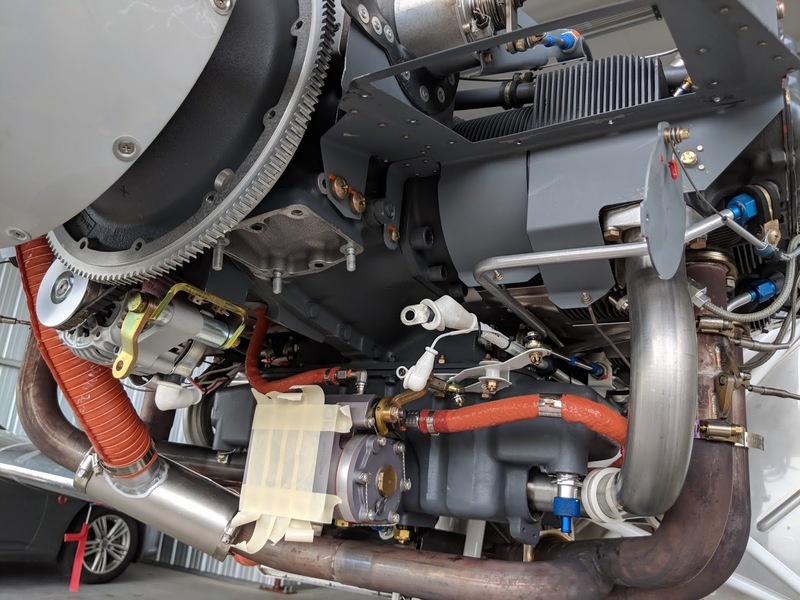 The starter spun, but the solenoid stuck so the starter gear could not push forward to engage the ring gear behind the prop. 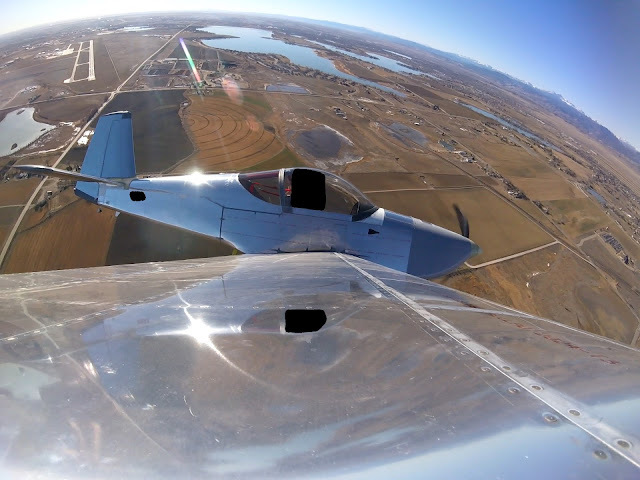 Here I am on the ramp gently tapping the starter (image from GoPro Hero 6 attached to canopy) so I could get home. 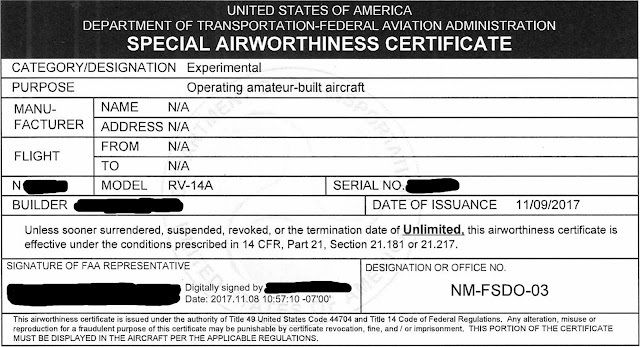 The following week, a call to SkyTech confirmed my suspicion of a stuck solenoid and set in motion a RMA request. Three weeks later, I had a new starter. A search of VAF found that a stuck solenoid is not an unusual problem with SkyTec. 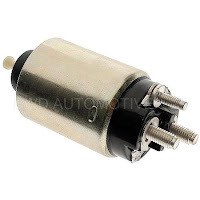 Many folks carry a spare solenoid and it turns out that one from a late model Ford Crown Victoria fits the bill. I found that a BorgWarner BWD S5613 is identical in shape and size and fits the SkyTec 149-12LS. The BWD S5613 can be found for $27+shipping. I now carry an extra solenoid in my parts and tool bag that always rides with the plane. Replacement in the field would be easy: Two hex cap screws then two nuts. Incidentally, that tool bag came in mighty handy. You can see some of its contents on the left wing in the image above. Here's a list, with photos, of what my tool bag is composed of. If the replacement starter suffers from a similar issue, I will investigate trying a B&C starter instead. It might be a challenge to get it to fit around the snorkel. To remove the starter, I took off the snorkel. When I changed my oil for the second time, I found that the starter had released a significant amount of grease from its housing onto the snorkel. SkyTech assured me this release of the packing grease was normal. Here is the broken starter showing where the grease came from. 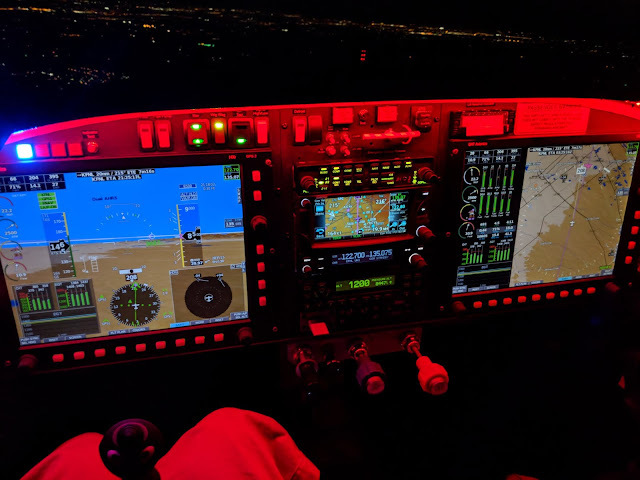 Fun Stuff: First night flight. 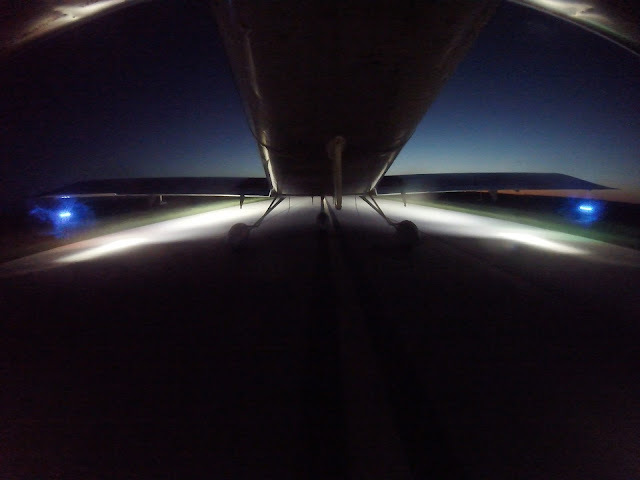 The bird's first night flight was today. 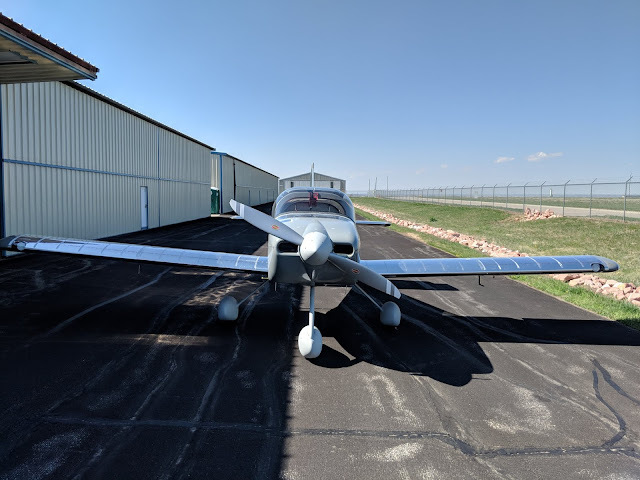 It was an experience to mind that I had only one engine, one battery, one alternator and the vast dark expanse of the Colorado, Nebraska and Wyoming plains below me. I have a set of indicator lights on my panel. The blue light indicates when pitot heat is off. It is crazy bright in the day, but not distracting. At night it's ridiculous. I had to cover it with a cloth (I later bought some light dimming covers to reduce the intensity). Below you can see how overly bright it is in flight at night. I could finally check how luminous my pair of AveoMaxx Hercules 30 landing lights were. Here I am at KIBM just beginning my takeoff roll. 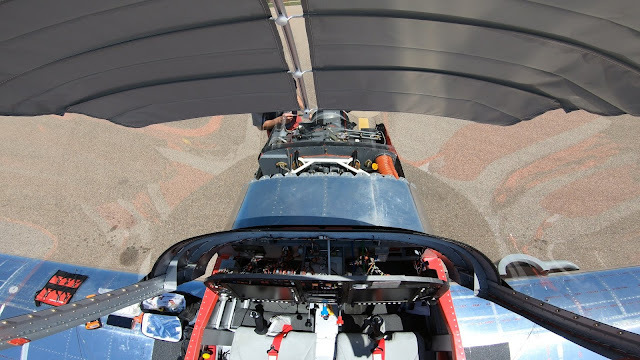 Views are from the cameras in the canopy and tail. When I returned to my home drome, there were 3 other folks in the pattern. They all remarked on how bright the lights were, unprompted. 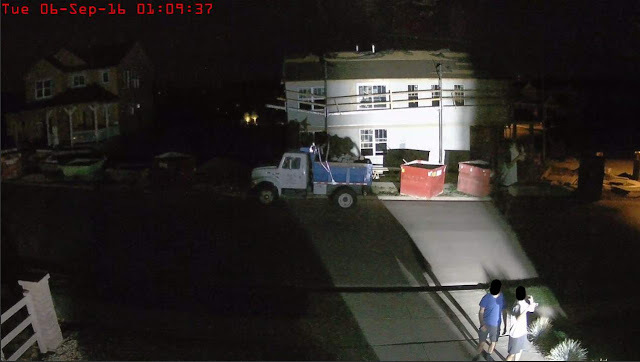 One guy said he'd need to carry a generator to run them! So my objectives of 1) being able to see and 2) being seen were met with these lights. Below are the Amperage draws for the pair of lights. Here are my posts relating to those lights. Here's a video from the tail cam on takeoff from KIBM. Here's a funny picture when testing the lights at 1 AM in my garage back in late 2016. 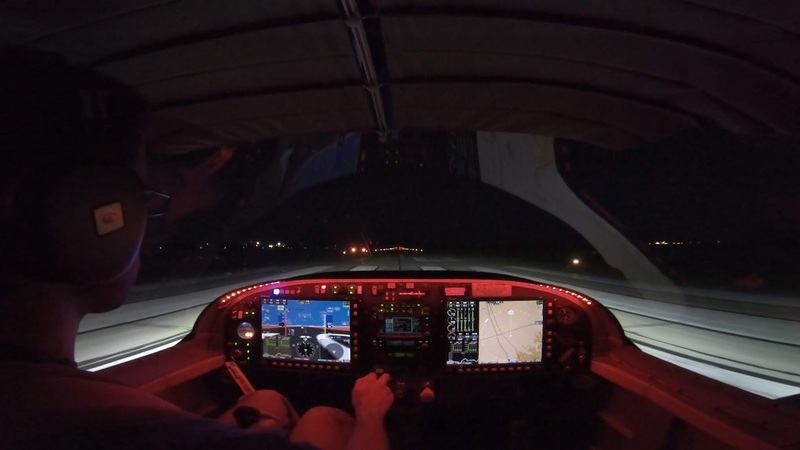 Fun video that same night showing the lights in wig-wag mode (taxi lights on, landing lights off) and with the nav/strobes on. The lights were all resting on the bulkheads (wing roots). 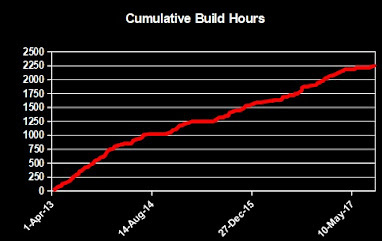 Here they are during the day (off). 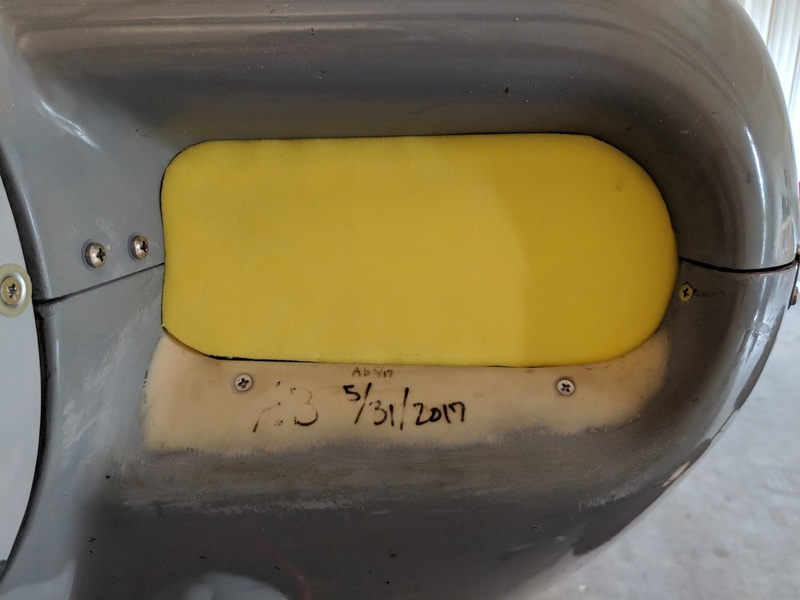 Maintenance: Cowl and NACA plugs. 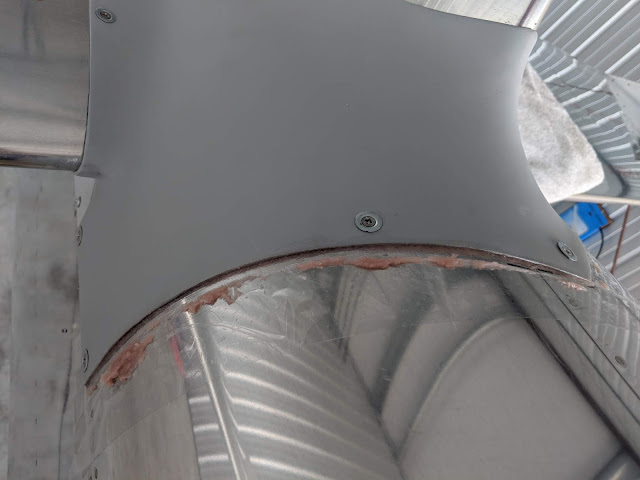 Custom cut cowl plugs are very expensive. Bruce's Custom Covers sells a set for $145. 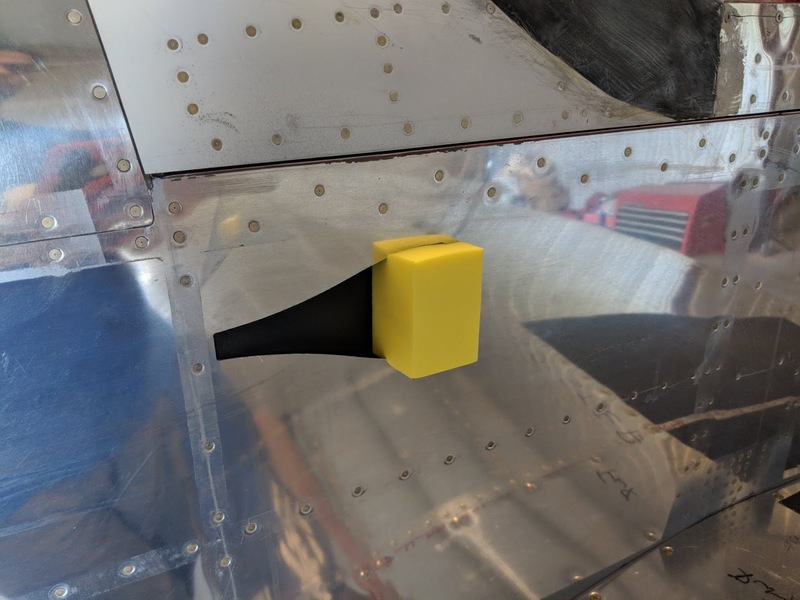 Van's says that their $59.95 plugs for the RV-6/7/8/9 will fit the the RV-14. Aircraft Spruce sells a set of cut-to-fit universal plugs for $38.80. One miserly fellow made his plugs out of some packing foam. 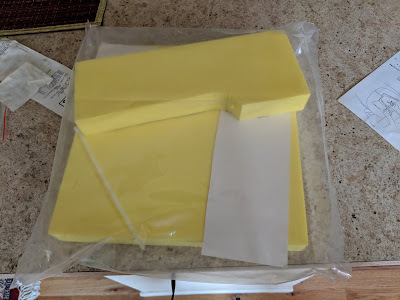 I snagged that universal kit from Spruce. It came with way more foam than I needed. So I decided to make NACA covers too. 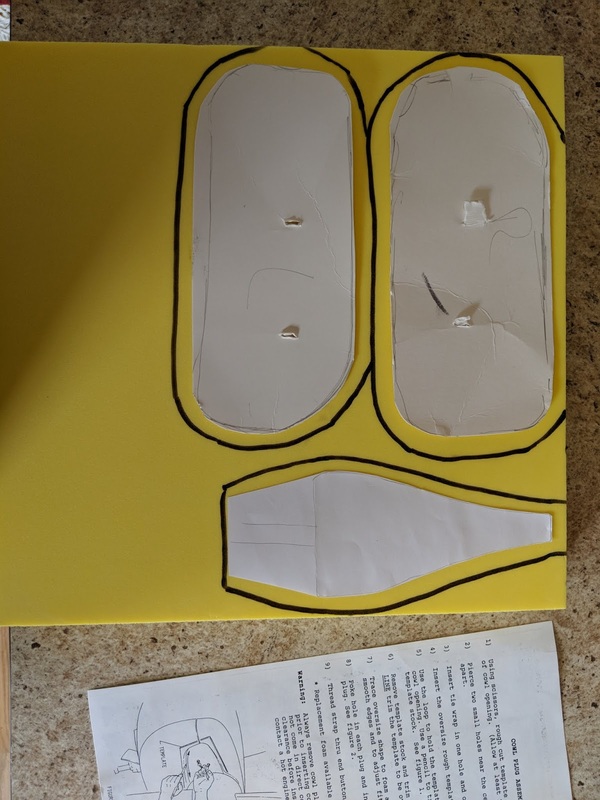 First you make templates for each piece. Then trace it on the foam and cut it with the band saw. Then you sand it down until you get the fit you want. 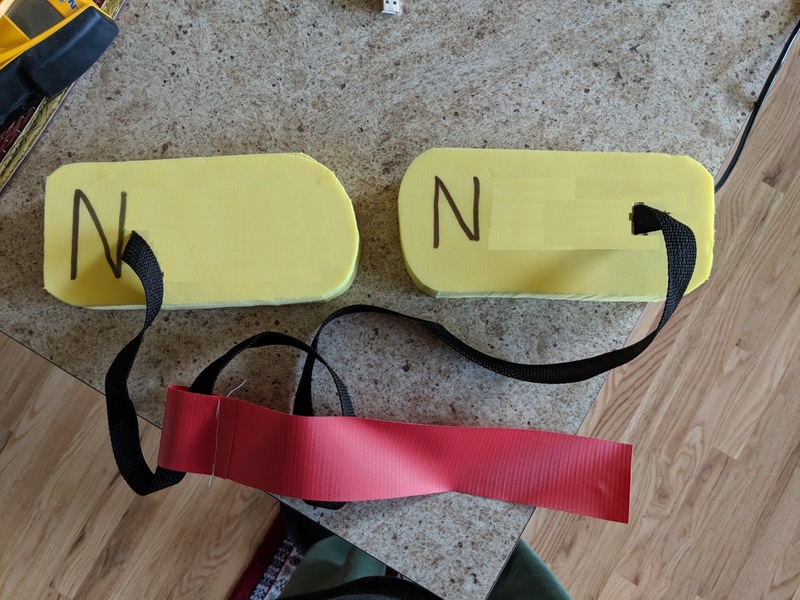 Attach the strap and flag, label them with your N-number and call it good. I originally wanted to make NACA covers that would fit the profile of the vent. But that was proving too difficult. 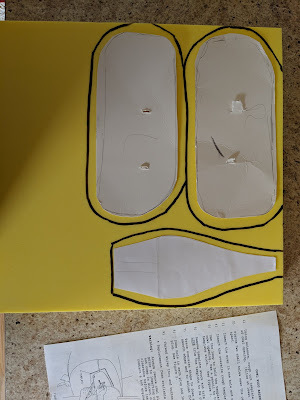 So I fashioned a 1" thick block and cut a slit in the middle to accept the skin. The block then just slides into place with the slit accepting the skin, like a tab-and-slot on a cereal box. I got a whole lot of foam left over. My friend with an RV-9A will use this to make his plugs.